Ronald Ellis promised that his bout with DeAndre Ware would set the table for a Super Bowl weekend leading to his New England Patriots winning the big game. If Friday’s main event on Showtime’s ShoBox series is any indication, than Ellis’ beloved Patriots are heading for their second straight Super Bowl loss. The combination of Ware’s aggressive approach and an injured right hand resulted in Ellis landing on the wrong end of a 10-round majority decision Friday evening at Main Street Armory in Rochester, New York. Ware prevailed by scores of 96-94 on two cards, overruling a 95-95 even verdict on the third scorecard. Neither fighter managed to establish a clear presence in the early going. Ellis, who hails from Lyon, Mass. began at a deliberate pace, jabbing occasionally and asserting himself only when necessary. Toledo’s Ware had other ideas in mind, intent on working his way inside and smother his opponent’s punches while getting off power shots from awkward angles at short range. Ellis all but abandoned his jab in round four, electing to trade but without setting up his power punches. It was an odd strategy, considering that it was detected he suffered an injured right hand by this point. Ware rode out the early storm, catching Ellis with his hands down in connecting with a right hand shot late in the round and forcing his opponent into the ropes. Still, it was a long-term investment by Ellis who forced a similarly aggressive pace in round five. The unbeaten New England product appeared to be the better conditioned of the two coming in, and it showed in this frame despite the hand injury as Ware spent much of it following around Ellis and at times walking directly into his power shots. Action slowed considerably in rounds six and seven, neither boxer doing much to set up their power shots or even seize momentum. Ware did his best to take advantage of Ellis’ decision to all but take off round six, punching whenever his opponent moved backwards and with his hands down. They both picked up the pace in round eight, albeit in a session where it was evident that Ellis’ right hand was no longer an offensive threat. Ware picked up on this, storming forward and looking for right hand opportunities of his own. He’d find one by rounds’ end, catching Ellis with his hands down and throwing a straight shot to the chin which Ellis took well but also to which he didn’t offer return fire. Ellis did his best to push his right hand per his corner’s instructions, firing his jab almost out of necessity and coming behind with straight rights that were meant more to freeze Ware in place than to inflict any sort of harm. It worked to the point of disrupting Ware’s offensive flow, but not enough to the point of outworking his opponent or even swaying the judges. In the end, it was Ware’s sharper punching over Ellis’ greater activity which ultimately won the contest. As was the case in the televised co-feature, the favored fighter—Ellis—threw more punches, but the underdog—Ware—landed more and at a higher percentage. Ware connected on 174 of 636 total punches (27%), including 105 of 386 power punches (27%). Ellis landed 150 of 768 total punches (20%), an even mix of jabs and power punches landed as he connected on 78 of 288 power shots (27%). Ware improves to 13-1-2 (8KOs) with the win, rebounding from his previous ShoBox appearance which resulted in his lone career loss. The 31-year old from Toledo, Ohio—who is co-managed by David McWaters and Tim VanNewhouse—dropped an eight-round decision to Cem Kilic last September, but prevailed on Friday in the biggest win of his career. As for Ellis, he’ll have to hope for his beloved Patriots to provide a better fate on the gridiron this Sunday. His hopes for a proper tablesetter instead becomes his first defeat, falling to 15-1-2 (10KOs). 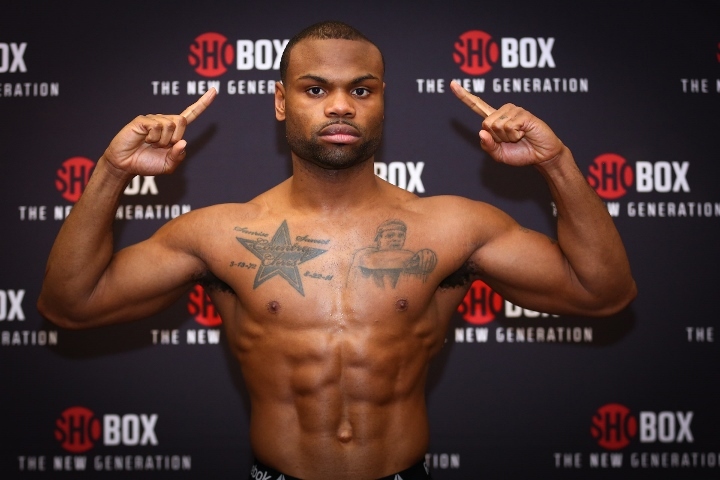 The bout was his fourth ShoBox appearance, three of which have produced every non-win verdict on his ledger after having to settle for draws with Junior Younan and Jerry Odom.